The illustrations come from the 1880 edition of J. W. Clark, illustrated by Gustave Dore, rather than the original Ormsby translation. According to Wikipedia, "Don Quixote, fully titled El ingenioso hidalgo Don Quijote de la Mancha ("The Ingenious Hidalgo Don Quixote of La Mancha") is an early novel written by Spanish author Miguel de Cervantes Saavedra. Cervantes created a fictional origin for the story based upon a manuscript by the invented Moorish historian, Cide Hamete Benengeli. 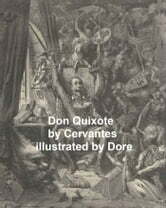 Published in two volumes a decade apart, Don Quixote is the most influential work of literature to emerge from the Spanish Golden Age and perhaps the entire Spanish literary canon. As a founding work of modern Western literature, it regularly appears at the top of lists of the greatest works of fiction ever published."... "Paul" Gustave Doré (January 6, 1832 January 23, 1883) was a French artist, printmaker, illustrator and sculptor. Doré worked primarily with wood engraving… At the age of fifteen Doré began his career working as a caricaturist for the French paper Le Journal pour rire, and subsequently went on to win commissions to depict scenes from books by Rabelais, Balzac, Milton and Dante... In the 1860s he illustrated a French edition of Cervantes's Don Quixote, and his depictions of the knight and his squire, Sancho Panza, have become so famous that they have influenced subsequent readers, artists, and stage and film directors' ideas of the physical "look" of the two characters. Doré also illustrated an oversized edition of Edgar Allan Poe's "The Raven", an endeavor that earned him 30,000 francs from publisher Harper & Brothers in 1883. Doré's illustrations for the English Bible (1866) were a great success, and in 1867 Doré had a major exhibition of his work in London. This exhibition led to the foundation of the Doré Gallery in Bond Street, London... Doré's later work included illustrations for new editions of Coleridge's Rime of the Ancient Mariner, Milton's Paradise Lost, Tennyson's The Idylls of the King, The Works of Thomas Hood, and The Divine Comedy. Doré's work also appeared in the weekly newspaper The Illustrated London News... John Ormsby (18291895) was a nineteenth-century British translator. 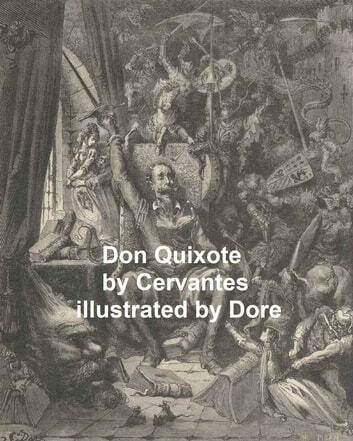 He is most famous for his 1885 English translation of Miguel de Cervantes' Don Quixote de la Mancha, perhaps the most scholarly and accurate English translation of the novel up to that time."